With temperatures expected to drop into the night, KDOT crews are working around the clock to prevent roads from freezing. KANSAS CITY, Mo. 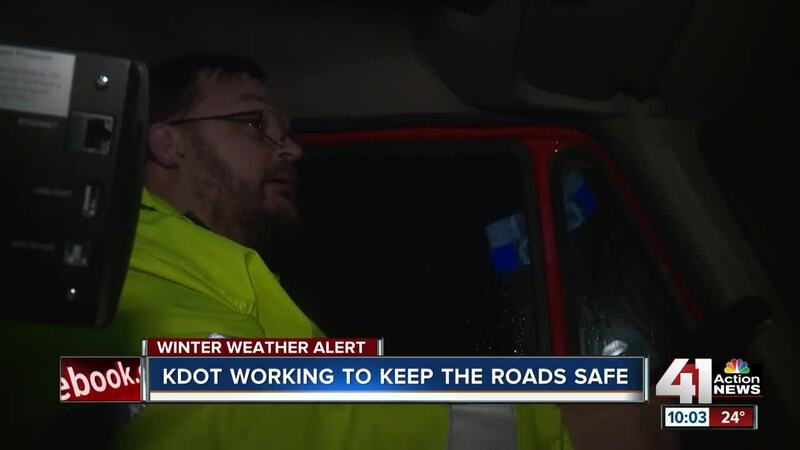 — With rain and temperatures expected to drop throughout the night , KDOT crews are keeping an eye and pre-treating roads. Crews started putting salt on different highways and bridges at 5 p.m. Tuesday. Night crews retreated the roads around 8 p.m. and will go out, throughout the night, as needed. "Looking right now our pavement temperatures are running about 32 to 33 degrees. When you're getting that close to that temperature, you really got to watch because that pavement could refreeze real quick, said Rick Looper, a supervisor for KDOT. In addition to monitoring air and road temperatures, crews will also be watching out for their safety. This past weekend, a KDOT plow driver was killed in a roll-over crash on southbound U.S. 69 near 207th Street.